Last week, I received a beautiful gift in the mail. And inside it was a note from the sender, explaining the enclosed scarf. She was passing it on to me, because it was buried in a drawer and she was afraid it would eventually be sent to a thrift store. She thought I might appreciate it – and she was So Right! I love this scarf! I love it for lots of reasons – and I can’t wait to show it to you! Here are both edges of the scarf, together. Though the fabric is somewhat colored with age, I think it was originally a light ivory color. I love the color scheme! I love the embroidered motifs! I love the delicate fabric! And I love the amazing fact that it is embroidered on this delicate, open, gauzy fabric with silk and with metal threads. We often have the idea that metal threads are only for heavier fabrics – velvet, sturdy linen, silk backed with linen or cotton. But this scarf seriously defies that notion. Notice in the close-ups that the fabric is literally gauze-like – like cotton voile. It has a very open, loose weave and is an extremely light fabric. The silk stitches in some areas (like the “blossoms” of the flowers) are rather densely stitched in a softly twisted, plump filament silk. The stitches are packed in to make the filling areas, but on the branches, they barely cling to the fabric, with stem-stitch-type stitches, stitched over just one thread of that fabric. And yet, they’re all there! The fabric is not torn. The stitches are intact. … and here’s a regular spool of thread sitting on the scarf. So the motifs are not huge – they’re about two inches tall, lending to the overall delicate look of the scarf. Every other motif is worked in this color scheme, with a brown flower blossom at the top (the triangular element), and deep cranberry-colored blossoms to the side. 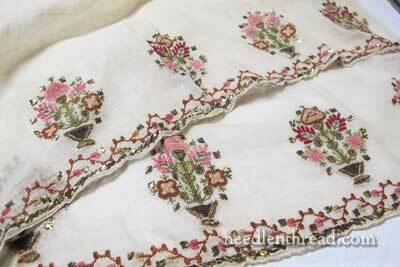 There’s also ivory and pink on this motif, along with the greenery and goldwork. I think the scarf if beautiful now – imagine what it looked like before the metal threads oxidized, while they were still bright gold! Here, you see the design along the edge of the scarf. The scarf is lying on a white cloth, so you can see clearly the discoloration with age. It’s likely that the piece was off-white or ivory, but age has also taken a toll on it. You can tell the fabric is discolored with age, because it has a mottled appearance rather than a consistent, smooth color. Some parts of the fabric are not as dark as others – probably those lighter parts were folded to the inside. The edge of the scarf has this metal plate running along it, whipped in a kind of broad stem stitch fashion. The plate along the edge is where most of the damage on the scarf is seen – the plate is banged up a bit, bent out of place, and the fibers of the fabric are slightly damaged. I’m not exactly sure of the origins of the scarf. The gift-giver suggested Greek. I would lean more towards early 20th century India, with the combination of silk and metal on the open cotton fabric, and the stitch styles – but that’s just a guess. Wherever it originally came from, I think it’s lovely, don’t you? Overall, the whole scarf is in fairly good repair. There’s some spotting and discoloration that I think will remove easily, and a couple little holes that I can darn. What will I do with it? Well, I’d like to wear it! But first, I’ll muse over the cleaning and repairs a while. If you happen to have any advice, my ears are yours.. Thank you, thank you, Mimi! The scarf made my whole week – and I hope everyone else has enjoyed seeing it, too! Maybe it will inspire a project in someone out there – what do you think? 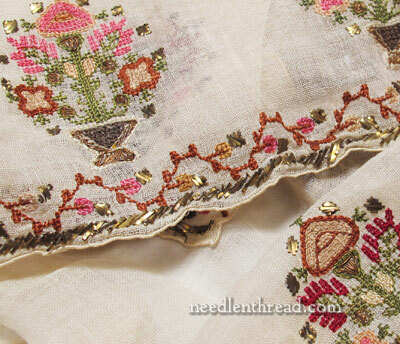 Are you up for some silk and metal thread embroidery… on cotton voile? spot clean with oxy-clean being careful not to touch the metal? I think I’d lay it on a pile of fluffy towels and just dab the cloth with a really mild oxy-clean water solution. OR dampen it with distilled water, carefully cover the colored threads and simply lay it in the sun. the edges wont be done but I’d be afraid of ruining them. No, not really, re last para, and yes, you should wear it. Just not with anything even slightly snaggy though. It would be lovely as decor. Perhaps screw a couple of lovely shaped, plain coloured door knobs into suitable timber and hang on the wall with the scarf hung loosely around the knobs. Not really swag like, more casually as if you’ve just absentmindedly draped it there when you came in. Goodness, you see the effect such a wonderful item has on the imagination of the aesthetically challenged. I like the metal thread as is. I’m one for original patina. So pleased Mimi could see the value in awarding you this precious old item. Exactly! No snaggy clothes. I like the patina of the metals, too! Mary: How did the stitcher secure the metal plate in those isolated diamonds surrounding each motif? Does the scarf feel scratchy when you put it around your neck or face? Janet. 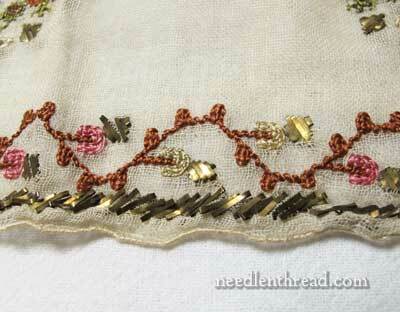 The ends are the only embroidered part, so there’s no scratchy stuff going on around the neck or face. My concern would be wearing it on something that’s particularly snaggy, like a fuzzy sweater… I’ll be careful about that, though! What a beautiful piece to find in the mailbox! I have some advice for cleaning the metal threads around the edge. Gold doesn’t tarnish, so these are probably a base metal alloy that were plated at one point. Come to think of it, even the best of metal threads aren’t pure gold. Anyway, a paste of cream of tartar carefully applied with q-tips, left to sit and then q-tipped off with distilled water and a soft cloth might work to bring those edge metal threads back. I’m not sure what if anything can be done about the more thready threads in the motifs, but cream of tartar does a wonderful job on copper, brass and other alloys and might bring these back to life. 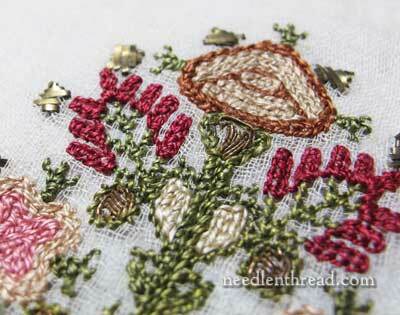 PS – I loved yesterday’s Stitch Play with the Griffin Stitch and can’t wait to try it. Thanks, Anastasia – yes, all metal threads that are “real” (even the “gold” ones) are made with alloys, so they eventually do develop that “patina” that comes with age and oxidation. Cream of tartar is great for taking stains out of linen, too! Funny! You just boil the linen (not linens embroidered with colors, mind) in a pot of water that has a few teaspoons of cream of tartar in it. Takes out even the toughest red wine stains…. I am amazed that the whole thing is holding together! My guess was India too for it’s origin. My first question was how are the ends are dealt with on the back? They would need to be both very secure and completely invisible. Especially with the relatively bulky threads. Any good ideas there? The metal bars look a lot like staples to me, so that application may be similar to today. Wow, what a wonderful gift. I can’t imagine doing that kind of work on gauze. What a treasure. Your gift is special in many ways but,to me the most important was Mimi recognized the fact one day her precious scarf would be tossed aside. Thrown into the charity bin without a thought to the workmanship or beauty the scarf holds. 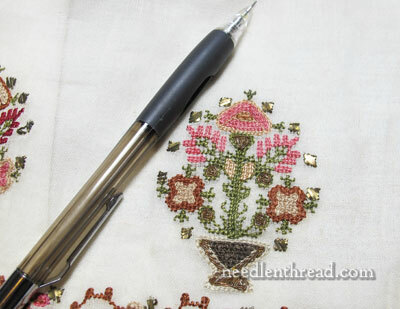 Upon finding needlework at a thrift shop or yard sale, I often wonder about the maker. The hands that held the cloth and threads, the mind that dreamed of it being used and treasured. Time, effort and love all being tossed aside or sold for pennies. Thank you Mimi for sharing your treasure with Mary. Thank you to you Mary for giving Mimi’s treasure, a voice. It speaks quietly of an era where workmanship was honored and only the best materials were used. A gentle soak in a mild soap followed by drying in the sun may help brighten the scarf a bit. By all means wear it, with jeans and simple blouse. The scarf will be the star without worrying about the metal bits snagging anything. The scarf is lovely! I’d guess that the metal plate had all edges sanded and smoothed so there are no sharp edges anywhere? And that hand-rolled hem – so tiny and evenly wrapped! How large is the scarf overall? There is similar metalwork on this tunic posted a while back by the Dreamstress. I thought this might help you with identifying the origins of your lovely scarf. Thank you for sharing the scarf with us. What is the back of the stitching like? Would the scarf be considered a reversible scarf? I’m just amazed by the fabric and the stitching. My thanks to Mimi too. Thanks for sharing this. I’m a belly dancer and I’ve been looking into Tulle bi telli/assuit which are a net fabric with metal detail. The antique assuit shawls go for a fortune and the modern ones are not as detailed as the antique ones. They were made with all sorts of metals, including silver and gold, so the surviving examples tend not to be the precious metal. My understanding is that they are embroidered with metal which is later flattened but there’s not much on the web really. I had wondered if it was like gold work with broad plate or flatworm but later found out about the rolling after embroidery. It does drape beautifully. Lots of antique shawls are getting reworked into dance costumes if the assuit has been damaged by moths in areas and dancers also dye them. If I got one I would just want to keep it and treasure it. I love the delicateness of the whole piece. Its so soft yet so striking. WOW – what marvelous work! I can’t begin to tell you how to clean it or how to repair it, but I do appreciate your pictures and descriptions. Your scarf reminded me of Flowers of Silk & Gold, four centuries of Ottoman Embroidery by Sumru Belger Krody. Took it down off the shelf and sure enough it fell open to a page with silk flowers and highlights with the same type of gold plate, worked as in your scarf, but the silk stitching appeared finer. The book shows a number of 18th & 19th century Ottoman (Turkish) headscarves and “napkins” with floral embroidery along the long ends executed in silk on linen or cotton with gold highlights on the flowers and gold at the edge. I’ll be interested to hear how you’re going to clean it. What a beauty! How nice that it found such a good home. I thought that it looked like background or waste canvas with framing staples to keep it taut! However, as a scarf it is unique. Very mixed-media. Did the sender have any information on it? Very pretty piece – and interesting!! Thank you for sharing and educating everyone just a little bit more! 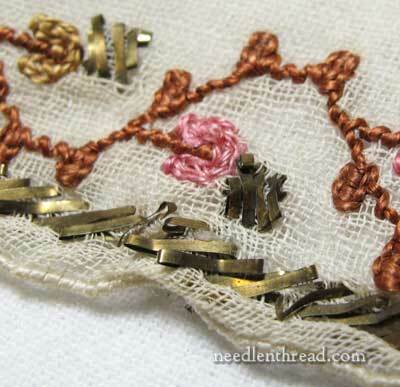 Regarding your comment that metal isn’t just for heavy fabrics – I wanted to mention how much metal thread “embroidery” I have found on cotton tulle in late Victorian/Edwardian garments. In my research into Princess lace, I have run across it numerous times. I remember because the thought of embroidering net with “wire” sounds kinda creepy! And, of course, by the time it is sitting in museum archives, the gold has gone black, so it doesn’t even LOOK particularly good!! But must have been beautiful dancing around in candlelight in its day. I have a “how-to” book about Ottoman embroidery and the way the motifs are aligned around the edge of your scarf immediately reminded me of its illustrations. The WOW factor here: it also has a stitch glossary, with illustrations. I’m very impressed with the workmanship of your scarf and agree it is unique and a wonderful gift. Put in another vote for the Ottomans! Plate work like this was done in the Eastern Mediterranean as well. It’s just plain gorgeous – thanks for sharing your gift with us as well! Oh, yes! It is so very lovely! It’s so sad that people don’t do the wonderful HAND embroidery of old. 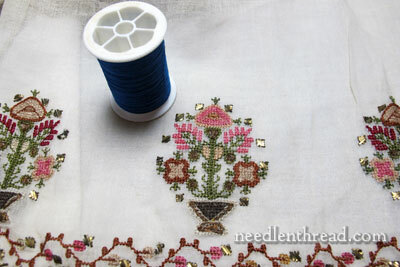 I love watching needlework programs but just about every time they do embroidery it machine embroidery. For one thing not everyone can afford those fancy computerized machines. But most importantly is the craftsmanship in hand work. I love sitting in my fave chair and doing hand embroidery. It’s so relaxing and fulfilling. I feel like part of me is in every stitch. Thanks so much for all the beautiful work you have shown us and all the instructions you give us. Hugs! Check out Jules Kliot’s Lacis Museum exhibition of The Asuit Cloth at http://lacismuseum.org/exhibit/Asuit/SlideShow/. He was kind enough to give me a personal tour when I was in the area on a business trip in May 2012. 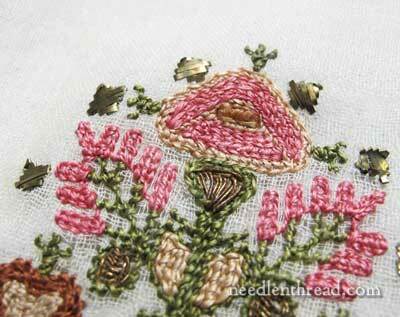 Incredible metallic stitches, see slide 4/90 for a close-up. Incredibly beautiful handwork. Therefore, I believe your scarf is Egyptian. Such a lovely piece of embroidery and the design is beautifully stitched, so delicate how was it stitched on such thin material especially the metallic pieces so complex. How lovely to receive this as a gift but you deserve it. 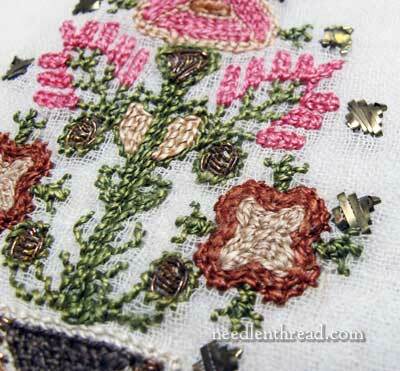 The delicacy of the design and the stitches is breathtaking. Thank you so much for sharing it with us! The simplicity and armony are the ingredients of Asia Minor embroidery (tzevres). If you will ever be in Greece and visit our museums then you will be able to understand the difference between Hellinic and Turkish embroidery. Of course there are also many similarities since we are neighbor. It is a beautiful piece. I’m not sure I’ll use it, it looks more like a piece for museum. I agree with Mara and the others who are thinking that is an Ottoman scarf, because of the fabric, the design and the shape as a scarf. The cover of the book “Beginner’s Guide to Ottoman Embroidery” by Joyce I. Ross is very much like a copy of your scarf. Just had to revisit this scarf. It is absolutely delightful. So delicate. 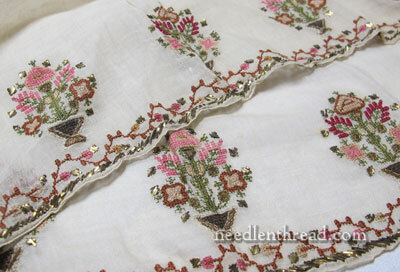 How the embroiderer did it on such fine material is remarkable. A joy. Your scarf is gorgeous. I’d be thrilled to have an old embroidered scarf. I would wear it, albeit carefully. I wear every one of the scarves I’ve embroidered. I have gotten stains on them a time or two. If the threads will bleed I spot clean, otherwise wash by hand with lots of cold water and – (cringe) Woolite. It works fine for new embroidery. You’re right that we think of using metals on heavy materials. I only used metal on one scarf and it was velvet. I shall have to rethink that in future. The metal threads on yours look lovely. I love your website and adore the pieces of work you are truly very gifted. About the scarf you received in the mail I had two of these made by my great grandmother passed down to me.They came from Macedonia but are of Turkish origin as our family is of Turkish decent that was once living there. Whilst I lived in Turkey for five years I did a course on the flat wire embroidery known over there as “Tel Kirma” the wire is dipped in either gold, silver or copper.It has a brilliant lustre to it when first used and then oxidises with time.I have used it to embroider on the very delicate wedding tule that has the hexagonal holes, and other matera such as suede, silk and a coarse fabric woven from horse-hair (not sure what it is called). The two pieces that I had inherited started to wear away at the folds so I joined the two ends together and had them mounted onto the remaining original fabric and framed- they hang above my bed and I love to look at them as it reminds me of my ancestors. The dedicated skill of embroidering such pieces under candle light still makes me feel very humbled. just thought you might like to know these scarves were not used around the neck – but tied around the waist as an ornament.Women tied these around their waists with the two ends at the front it was worn over Turkish pantaloons and they were only used on special occasions. Men also wore these just like the women. Also I don’t recommend trying to polish the wire threads as it is considerred to be more favourable if they’re oxidised. I came across your site while searching for some information on Turkish embroidery. If you Google Turkish shawls , you will see examples of your lovely scarf. Wonderful ! This may be either Romanian, or Bulgarian.I wouldn t exclude Greece either. definitely from the balkans. In my country, in Romania, we make scarves similar to this ones. especially the old traditional blouses.This scarf is exquisite ! We call that cloth “melted cotton “. The work is typical of Turkish embroidery, but you may have found this out since you posted this scarf. I do not think I have ever thanked you for giving my book a very positive review when it first came out in 2007. So a huge thank you for that. what you have there is not a scarf but actually a Turkish Towel. They would have been used for ritual handwashing, and used as a sign of respect during dinner with guests. My guess is that this one is from the 18th century.